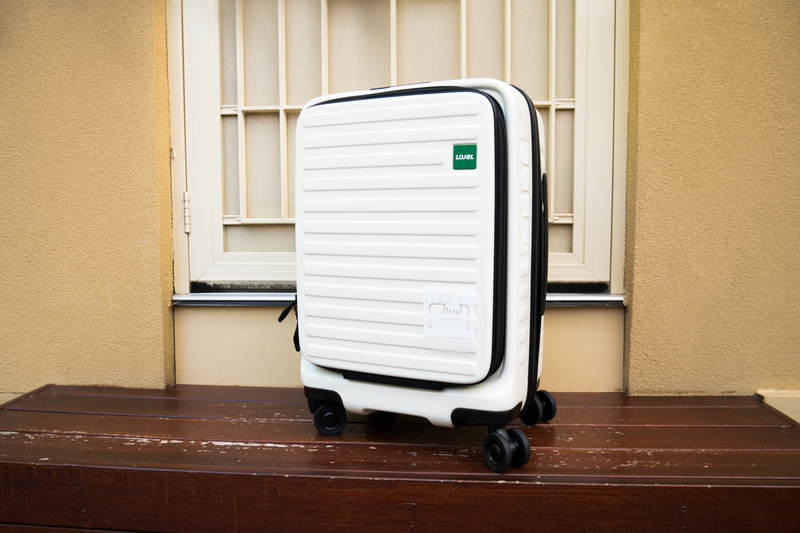 Lojel Cubo Suitcase Review – The Best Carry On Luggage? On the hunt for a shiny new 4-wheeled companion for your next family trip? Well, folks, send the search party home. Lojel has got you covered like hot sauce on wings. The team at Lojel was kind enough send me a Lojel Cubo carry on luggage to test drive on our 3-month whirlwind journey through Asia. I'm not even lying, this is the finest, sleekest piece of luggage I have ever owned. All my previous 'functional' carry-on suitcases were certainly not a sight for sore eyes, but, they did the job. Truth is - they were never worthy of an appearance on the 'gram feed. You know what I'm sayin'? 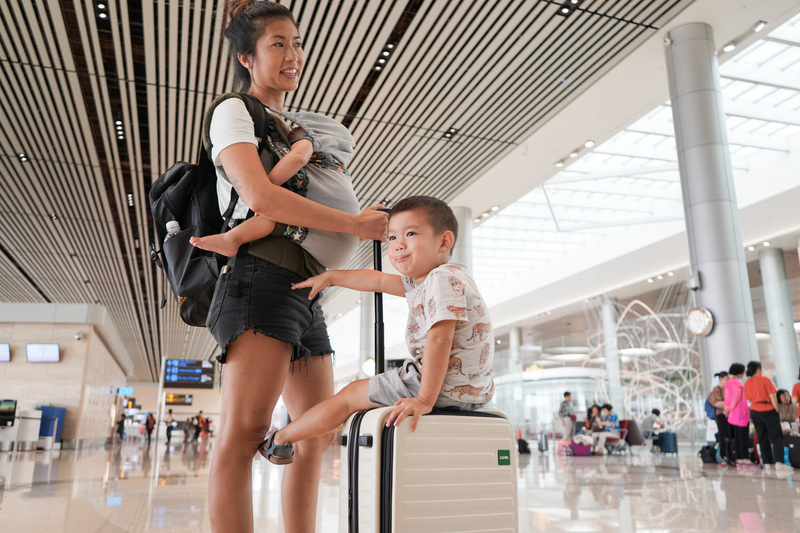 From the Cubo's devilishly handsome aesthetics (I kid you not - I literally have a dedicated cloth to wipe away scuff marks each time we travel), to its innovative way of compartmentalising (think front loader washing machine-esque), this hot piece of luggage needs to be on your pre-holiday shopping radar. 2 Why Should I Buy A Lojel Cubo? 4 But - Will It Break? Some of you are probably asking, "Who the hell... is Lojel?" See what I did there? It rhymed. Let me shine some rays of enlightenment on you. For one, the Lojel luggage brand has been around for almost 30 years, which means - they ain't no rookies. They are O.G.s when it comes to the travel luggage game. Secondly, it was originally founded in Japan - and, if you've ever been to Japan, you'll know that the Japanese know how to make stuff good. Suitcases are no exception. Their slogan, "Made for Travelers by Travelers" couldn't ring more true. Specialising in hard case luggage, you'll find a diverse range of designs on their website to pick from, alongside a small collection of chic bags and backpacks. Why Should I Buy A Lojel Cubo? Because... as a fully-qualified parent, you can roll around your child on it? It can also teach a baby how to walk when you don't have a baby walker handy on your travels. 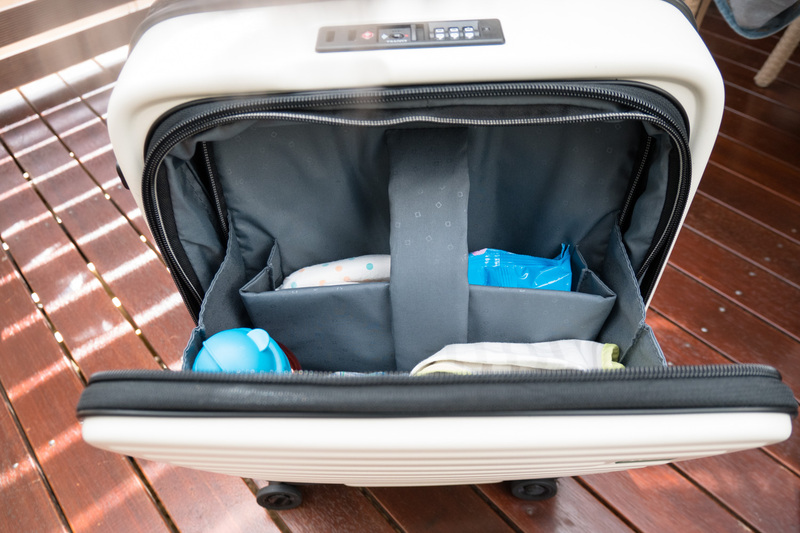 Oh, and we discovered that we can use the easy access front compartment as a nappy bag section to stash a small amount of nappies, wipes, baby snacks and drinks. Goodbye nappy bag - you have been made redundant. I probably needn't mention this, but I'm going to anyway because I am super late on the 4-wheel suitcase bandwagon. It has four buttery smooth moving wheels that I, plus the kids, just cannot get enough of. You'll find yourself involuntarily spinning 360s and doing doughnuts because it's just that fun to manoeuvre around. As mentioned earlier, the Lojel Cubo features an easy access front compartment with a laptop sleeve, which - mind you, is extremely handy given that you are asked to take remove your laptop or tablet each time you pass through security at the airport. It also has a very large and spacious expandable main compartment with two zippered slots along the sides. And, yes - it's expandable. For the amount of space the Cubo provides, you'd be surprised to find out that you can still make it bigger. To give you a vague idea of how much can fit inside this beast, I'll reveal exactly everything we carried inside on our travels. 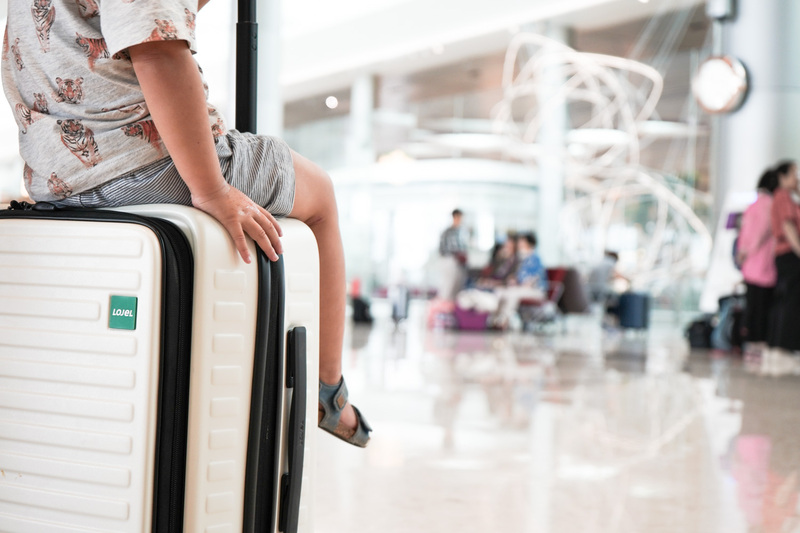 We probably went a little overboard with our contents - take a look at this carry-on luggage packing list to help you conquer any long haul flight. 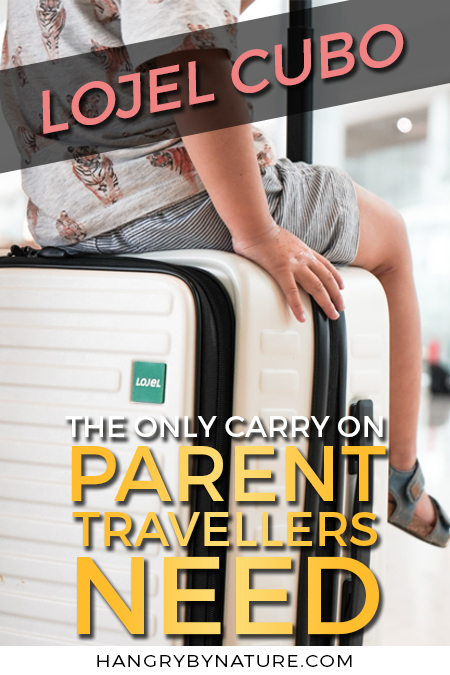 Need a matching suitcase for your kids? Take a look at this list. But - Will It Break? Look, I haven't thrown it off a building (yet) or launched it from a catapult (yet), but I can safely say that after 3 months, 6 countries, and over 10 flights - it is still completely in tact, and completely scratch free (save for some scuff marks which I cry myself to bed about every night). Watch our full video review (you won't regret it) to witness yours truly fly kick the Lojel Cubo into a wall. Who came out in tact? Find out below. Are you seriously not yet convinced that you need a Lojel Cubo carry on luggage for your family travels after my Academy Award-winning review video? Then, I don't know, you may want to reassess your values in life. In all seriousness, I would never recommend anything to my beloved readers and viewers if I didn't truly feel like it would add value to your life, like it has for mine. 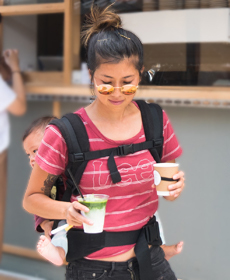 The Lojel Cubo served multiple purposes for us, and it hit the spot with each and one of them - doubling as a nappy and work bag, as well as being spacious enough to fit an inflatable leg rest, spare clothes and kids' toys. Oh, and toddler ride-on. Now, I can only say to do this at your own discretion as it's not designed to hold children, but - we have no regrets as long as you do it safely and supervise 100% of the time. Find the Cubo on Lojel's official website or get one on Amazon. To stalk the #SquatFam (aka Hangry Squad) more closely, you can find us on YouTube, Instagram and Facebook. We always promised to deliver fun and a less serious approach to life because I'm really just a 3-year old trapped in an adult body. 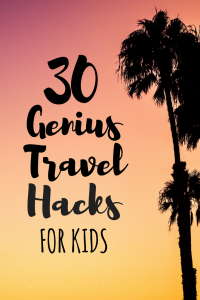 I’m taking my toddler to mexico in August and I need new luggage! Thank you for the info! I’m taking my toddler to mexico in August and I need new luggage! Thank you for the info!! Can the 15″inch MacBook Pro fit in the front section? Hi Daniel! It’s a little tight, but it can fit. I have a 15-inch Macbook Pro as well and managed to squeeze it in. Hope that helps!